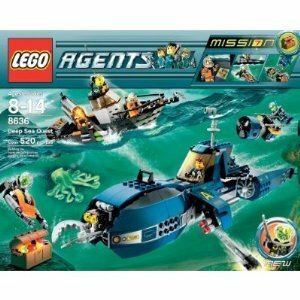 Dive below the sea on a top-secret mission! Lift the front from the submarine to reveal hidden missiles! Detach the scuba jet for more underwater adventure! 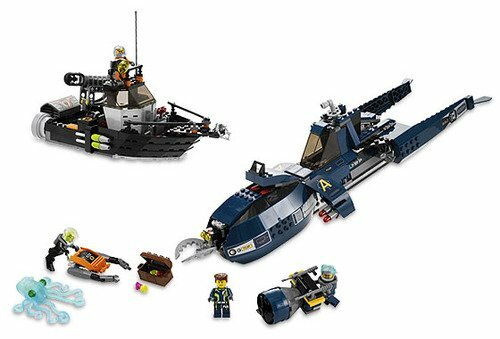 Get there 1st in the tactical operations sub and use the detachable scuba jet and grappling hook to total the mission - but watch out for the glowing deep-sea octopus and the enemy boat's rocket and torpedo launchers! 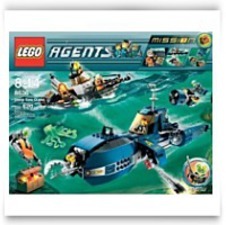 When danger threatens in the ocean depths, it's up towards the LEGO Agents to conserve the day! Open the sub's cockpit and put Agent Charge in the controls! Hide the treasure chest inside the sub's secret storage hold! The mission is to cease Dr. Inferno's henchmen Slime Face and Break Jaw from recovering the sunken treasure.